Well established, healthy trees can have a significant impact on the value of your home, while poorly maintained trees can pose a danger to you and your house. Proper tree care is necessary to make sure that your trees are attractive and will last for many years to come. While this service is an investment, it will pay off in the long term and it is vital that you choose the right tree care team. Should You Cable Your Tree? The beautiful, well-established trees that you see while driving around take years to grow into what you see before you. In order to preserve your trees or allow your trees to become established, they must be maintained properly with the assistance of arborist services in Gainesville. Arborists have received the necessary training and education about tree care that will provide you with the .results you are looking for. Before you consult a company for your tree needs, make sure that you find the right one. There are plenty of tree care companies that claim to be qualified to help establish new trees, prune limbs and remove diseased trees. However, many of them are not properly trained. That is why it is better to choose a company that works with arborists. In order to become an arborist, candidates must have three years of experience in specialized tree maintenance and pass a comprehensive exam that has been compiled by a panel of experts. When you hire a company with a certified arborist on staff, you can be confident your tree will be taken care of. Ask your Gainesville arborist if he or she is a member of the American Society of Consulting Arborists (ASCA), the International Society of Arboriculture (ISA), or the National Arborist Association (NAA). While these certifications may not guarantee how accomplished your arborist is, they will indicate if the arborist is respected in his or her field. Once you begin contacting specific arborists, your goal should be to discover if they are reputable. Research online to see experiences of previous clients. When your arborists come to inspect your tree, ask them what techniques they wish to use moving forward. Are they committed to finding a solution that will not require tree removal, except as a last resort? Do they know how to trim your trees without compromising the integrity or future growth of your tree? When you are in need of Gainesville arborist services, choose SkyFrog Tree Service. We are a fully licensed and insured tree care company that is dedicated to providing you with a solution that is high quality, efficient and safe. We provide a range of services such as new tree establishment, seasonal trimming, emergency storm response, and tree removal. Contact SkyFrog Tree Service today for reliable and honest assistance. Working with trees can be a hazardous task. Even when the proper safety precautions are utilized, people and property can be in danger of injury. That is why it is important to make sure that the arborist in Gainesville, FL that you are consulting has insurance. You will also want to work with a company that will analyze the possible outcomes carefully before beginning any service to ensure the safety of your family, their employees, and your property. If the worst does happen, you will not be held liable for any damage that is caused on your property. Tree care involves complicated tasks that should only be attempted by knowledgeable arborists. If an inexperienced worker attempts to prune or remove a tree, irreversible damage could be imposed on the tree or falling branches may hurt someone. Instead, make sure you seek service from a certified arborist. If someone is claiming to be an arborist, he or she is stating they have experience, knowledge and training regarding planting and maintaining individual trees. In order to provide evidence, some arborists volunteer to get an ISA arborist certification. This certification requires applicants to prove their level of past experience with caring for trees and to pass an exam that was created by some of the top tree experts in the country. While this certification is optional, it assures customers that the arborist has the necessary skills to care for tree correctly. In order to understand the services commonly provided by arborists, you must first understand the different parts that make up a tree. Roots allow trees to absorb water and minerals from the soil. They extend out from the tree approximately two to four times the length of the tree crown. Surprisingly, though roots are responsible for anchoring the tree in the ground, they are located approximately only three feet beneath the surface. By carefully performing root zone therapy, your arborist in Gainesville, FL, will remove soil from around the roots to look for significant issues such as girdling roots, brown roots or black roots in order to provide you with a solution. This process will also help to aerate the soil and remove any debris. Leaves are important for their ability to perform photosynthesis. They make food for the rest of the tree, release oxygen into the surrounding air and reduce wind resistance. Leaves can often indicate issues within your trees such as disease, pests or drought. Your arborist services will include careful inspection of the quality of your leaves so that a solution can be found. Branches grow out to create the crown of the tree and support the growth of leaves and fruit. They are also useful for providing leaves with water. If branches are left to grow on their own, they can become too heavy and weaken the tree or endanger surrounding structures. Experienced Florida tree trimmers can regularly trim and remove diseased branches to ensure your tree’s stability. The trunk is composed of five different layers: outer bark, inner bark, cambium cell layer, sapwood, and heartwood. Each layer has a specific function that ensures the tree is healthy. Because the trunk is so integral in the way a tree functions, it is important to make sure it is healthy. Your Gainesville arborist will look for harmful pests, which may have infiltrated the surface and provide techniques to protect the trunk from freezing temperatures. While there are a variety of factors that could be influencing the health of your tree, there are several problems that are common in North Central Florida. While there are endless numbers of insects that may surround your tree, there are a number of insects that have the potential to cause severe damage. Signs of invasive pests depend on the type of insect. Boring insects leave behind small piles of sawdust at the base of the trunk, entry and exit holes in the bark, and sections of the crown that are dying or wilting. You can detect chewing insects by examining leaves for evidence. Sucking insects cause honeydew production, leaf dieback and scaly formations. Your Gainesville tree care company can help you correctly identify the problem and control the pests before they can wreak more havoc on your tree. It is important to consult certified arborists from the beginning. If you plant your tree using the wrong methods, your tree may slowly die even if you apply every other tree care tactic correctly. For instance, some homeowners plant the root flare of a tree too deep so that the tree is unable to form a secure root system. Diseases can greatly impact the health of your tree and may even cause irreparable damage. Common diseases include Oak Wilt, Pine Wilt, Dutch Elm Disease, Dogwood Anthracnose, Sudden Oak Death and many others. Your best chance of saving your tree is to identify the symptoms early. Indicators include tree decay on the trunk, unnatural tree architecture after improper pruning, and cracks and cankers in the bark implying that the bark and trunk are weak. If your tree has an insufficient water supply, it causes leaf scorching, wilting, increased vulnerability to pests and diseases and stem dieback. When your certified arborists notices these symptoms, he or she can advise you on how to improve your watering habits. In order to prevent this situation from happening, it is important to ask your arborist for tree species that will thrive in the North Central Florida climate. Whether you are in need of regular pruning or an emergency tree removal, you will want to consult a tree company Gainesville, FL, residents trust. At SkyFrog Tree Service, we have several ISA certified arborists on staff and a team of highly trained workers. We are dedicated to ensuring the health of your trees and doing everything we can to save them. Contact us today for a consultation or estimate. Trees, especially well-established trees, may appear to be indestructible. However, trees grow in the direction of sunlight and might overextend or grow multiple trunks. In these cases, trimming will not suffice to protect your tree and surrounding property. If you suspect that your tree might need cables, contact a Gainesville tree care company like SkyFrog Tree Service to come inspect your tree and expertly add any necessary cables. Every homeowner knows the danger dead branches can pose to their house and property, but live branches are even more hazardous because they are much heavier. When our Gainesville arborist deems that cabling is necessary to prevent these live branches from collapsing, our team will come to install cables for you. To attach them, bolts are drilled into different sections of your tree and then a strong steel cable is used to connect the two anchors. These cables will work to reduce the strain on the structural integrity and prevent the branches from moving independently and dangerously during Florida thunderstorms. When Will an Arborist Recommend Cabling? The purpose of cabling is to help stabilize your tree and remove the pressure placed on its roots, trunk and branches. If your tree has multiple trunks, particularly if it creates a “V” shape, it will be in significant danger of literally splitting in half. 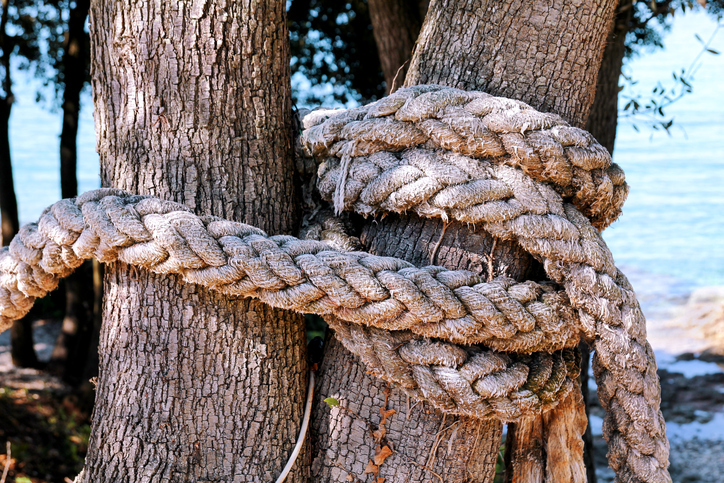 Cabling can help by distributing the weight of the various main trunks and allowing them to support each other. The same is true when a branch has developed off the trunk and is growing quickly. These branches are heavier than the rest of the branches, and if they break off, they will cause severe damage to the surrounding area. An arborist can prevent this from happening by adding a cable from this branch to the main trunk. Though you may be tempted to stabilize your tree with cables by yourself, it is vital that you consult professional tree care services in Gainesville, FL. Certified arborists have thorough knowledge about tree health and maintenance and will be able to reliably assess whether your tree needs cables and, if so, where the anchors should be placed. Our highly trained team at SkyFrog will install them using materials and techniques that satisfy the standards of the industry. The cables will then be strategically placed higher up in the canopy so they will not take away from the aesthetics of your tree. When you suspect that the stability of your tree has been compromised, contact SkyFrog Tree Service immediately. Not only can we help you install cables, but we offer services for all of your other tree care needs. Our certified arborists and experienced team members are dedicated to maintaining the health of your tree to help it thrive for many years to come. In worst case scenarios, we can also provide tree removal in Gainesville, FL, services as well. Call our office today to find out how we can help your trees. Knowing which plant hardiness zone your home or business is located in goes a long way toward keeping your trees healthy during a long, hot Florida summer. For the Gainesville area, we blend Zones 8 and 9. This means certain species of trees will have a higher heat tolerance than others. The tolerance, along with other factors, has a crucial role in the tree’s health during all life stages. Young trees need persistent attention to begin a healthy and long life. This attention begins by planting a new tree in a place where it will have plenty of space to grow. Tree supports, such as stakes, are used to prop up a young tree as it begins to establish its root system. New saplings should receive up to one inch of water each week, focusing on allowing the water to soak into the root ball and surrounding area. Mature trees are considered to be in the prime of their life. Caring for a mature tree is usually straightforward, focusing on health maintenance and minimizing risks to people and property. Periodically check a mature tree for signs of disease, pest infestation, and stress. SkyFrog Tree Service provides professional tree trimming Gainesville, FL service for all species of mature trees. Trees reach senior status based on species, not a specific age. With its advanced age, a senior tree needs a little extra TLC. A constant mulch layer, usually two inches to three inches deep, promotes moisture retention and slows soil compaction and erosion. Check mulch layers during the summer and add more as necessary. Because senior trees continually weaken, bracing, cabling and other support systems may be recommended, especially during hurricane season. Morning is the best time to water a tree, regardless of age. For an established tree, it’s important the root zone receives an appropriate amount of water. Plan on watering a tree three times longer than the lawn. A long screwdriver or yardstick should easily penetrate six to eight inches into the ground to check if a tree is receiving enough water. New growth withers before reaching full growth. The tree canopy is sparse with off-color and undersized leaves. Trees are an integral part of any landscape but the surrounding landscape plays a significant role in their health. Here are three common landscaping features that affect trees of all age and health. Heat sponges, such as block walls, glass, and water surfaces, absorb and reflect the sun’s heat during the summer. If future landscaping plans include installing a retaining wall or body of water, be mindful of placement to standing trees. A healthy tree can quickly be stressed by more heat and decline rapidly. Many homes and businesses in Florida rely on sprinkler systems to supplement natural watering from summer rains. But if the system is damaged, or sprays in a steady, rotating stream, it might be overwatering the trees. Mature trees usually need less water than a lawn and overwatering exposes a tree to decay, disease, and pest infestations. Summer in Florida brings a regular mowing schedule for many people. Though this routine keeps the landscape immaculate, mower blades and string trimmers can cause damage to exposed tree roots and trunks. If struck, the tree then re-allocates its nutrients and strength to heal these areas. Repeated injuries will stress a tree to the point its health starts to decline. From regular afternoon thunderstorms to major hurricanes, trees in Florida are threatened every year by summer storms. As a home or business owner, there are three things you can do to prepare and protect your trees. Regular tree pruning removes damaged or dead branches that pose a risk to people and property if they were to fall during a storm. A professional tree care company such as SkyFrog Tree Service can evaluate a tree and determine what branches and limbs should be removed. Lightning protection is one of the many tree care services offered by SkyFrog Tree Service. Our certified arborists can recommend a lightning protection system that safeguards the tree and surrounding property in the event of a lightning strike. Trees experience a number of different reactions to factors within the surrounding environment — among these reactions is tree stress. Air pollution, soil conditions, insects, and weather patterns are among the wide range of tree stress catalysts. Trees of all age and stages of growth can experience tree stress, but knowing how to identify and treat the symptoms of this condition is vital both to tree health and longevity. One thing to keep in mind is the occurrence of tree stress doesn’t necessarily indicate that the affected tree is dead or dying. A certified arborist in Gainesville with SkyFrog Tree Service can help your trees recover from a stress event and provide you with tips on how to prevent the future occurrence of tree stress. Knowing how to identify the common signs of tree stress is the first step in recovery to any tree. During an appointment for tree trimming services, professional arborists will examine the tree for various signs of stress and thereafter, provide a recommendation for treatment. A tree with sparse leaves or leaves that grow in patches is a primary indicator for tree stress. Branches with buds and no leaves typically indicate that the root system is restricted and/or the condition of the soil is poor, resulting in a lack of sufficient nutrients and reduced leaf growth. Early dropping of leaves can occur during the summer or early fall — far before most trees should lose their leaves. This issue is usually related to an overcrowded canopy, disease or pest infestation or insufficient moisture levels. Conversely, the leaves may suddenly change colors for a variety of reasons, which include soil compaction; the loss of mineral recycling and nutrients; a restricted root system; disease and/or a pest infestation; and either mechanical or nature damage to the tree. A change in leaf color to brown or yellow can be caused by overwatering due to an excess in rainfall, a sunburn, or a fungal infection. A fungal infection can occur on its own, but it is more prevalent in cases of overwatering to trees. Some tree species, such as oak trees, naturally develop small cracks or splits in the trunk as the tree grows. However, drought; incorrect pruning or trimming; lightning damage; and root cutting can cause damaging cracks or splits to form as the tree becomes more stressed. Certain types of fungi, such as honey fungus, can deteriorate the health of a tree in a short amount of time. These yellow-brown mushrooms grow in clusters at the base of a tree and have a distinct white ring around the stem and flat tops. Honey fungus thrives in overwatered areas often located at the tree base. Signs of this type of infestation also include concentrated and persistent flower or fruit growth; white fungal growth under the tree bark; pale and small leaves; and fungi growth with sweet odors. Tree stress treatment often depends on the circumstances of the individual tree and the results of a comprehensive evaluation from SkyFrog Tree Service. In certain cases in which treatment is ineffective, emergency tree removal may be necessary to avoid potential safety hazards and damage to people and surrounding structures by the tree. Call SkyFrog Tree Service today to schedule an appointment. If the tree is stressed due to a lack of moisture, a Gainesville arborist with SkyFrog Tree Service may recommend a custom watering plan. This may include slowly watering the tree for at least an hour once every few weeks to allow the water to soak deeply into the root system and the surrounding soil. A slow absorption rate minimizes further stress to the tree. which also reduces the risk of disease and infestation of pests. The longer a stressed tree is left without appropriate treatment, the more susceptible it becomes to developing a tree disease or an insect infestation. SkyFrog Tree Service will create a custom treatment plan that eliminates any occurrence of disease or pests while taking preventive measures to avoid a future recurrence of these problems. This routine part of our tree care services can also be an effective tree stress treatment. Our arborists will evaluate the tree and determine which branches and/or limbs require pruning and which portions need trimming. When performed professionally, pruning and trimming can improve the overall health of the tree and prevent tree stress. Adding a new layer of mulch or replacing existing mulch can help with nursing a stressed tree back to health. The mulch layer regulates the temperature of year-round soil to prevent extreme changes that may cause stress to the entire tree structure. However, avoid placing mulch against the trunk of the tree — called volcano mulching — as it invites insect and pests. Soil conditions play a direct role in the health of a tree. If the surrounding soil has been compacted — such as is common after a construction project — the roots will struggle to gather enough oxygen and water from the soil. This inhibits root growth, which in turn inhibits adequate development and growth of all parts of the tree. A tree service company that offers a range of arboreal services, such as SkyFrog Tree Service, can test the soil for nutrient levels and provide recommendations to improve the condition of the soil for overall healthier trees. For more than four decades, SkyFrog Tree Service has seen first-hand the role summer care plays to keep trees healthy throughout the year. Our certified team uses the latest tools, techniques, and tree care information to give you many summers of enjoyment. To schedule an appointment for tree service Gainesville residents can count on, contact SkyFrog Tree Service today!